Bought a toad that wasn’t even for sale! 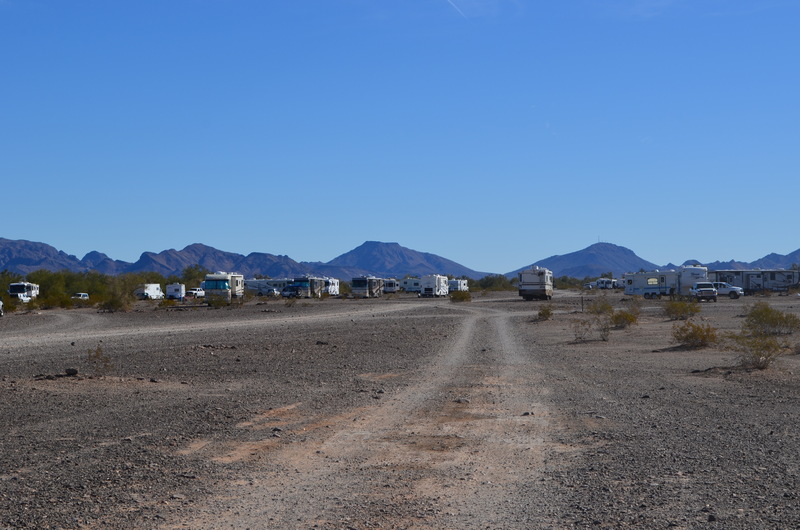 Some friends of John and Linda were in the market for an RV and they drove over from Scottsdale to look at one on mile marker 112. Whey they were looking at a rig a great little Samurai drove down this road and Linda was yelling at me to ask them if it was for sale. I looked at it but didn’t ask them to pull over. I could have kicked myself. Then a few minutes later I saw them come back the other way and I just had to pull them over. They were on their way to do some shopping in Blythe. I asked them if they were interested in selling it and low and behold Charley the owner quoted me a price that he wanted. I looked it over real good and he told me a lot of good things about it. 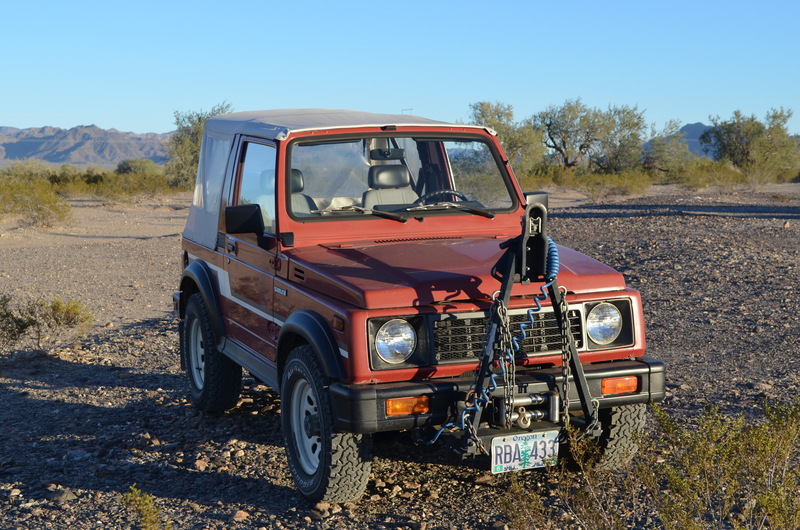 It was a 5 speed manual 4X4, with new tires and brakes and a trailer hitch as well as a wench in the front. I was sold. I took down his name and phone number, but wanted my friend John to look it over with me. I called them back and told them we wanted to check it out again. John and Cookie went with me and everyone thought it was a great deal. I called him and told him I would have a check to him by in two days. Today I went to Parker with Roger and got a cashiers check from the bank then went over to pick it up. I am so excited about my new toad. It is just what I have been looking for these past few months and worked hard to save the money. I also took the plunge and made plans for this summer. I have decided no to work once I heard about what John and Linda had planned. They are joining the Northwest Lazy Daze group and travel for 3 weeks into Alberta Canada. My friends Ed and Carole, who just sold their home in Florida and are moving to Colorado will be going as well. It should be a great trip. We meet in Baker, OR, then into Idaho where I have already made reservations, and then into Alberta. It should be a fantastic trip as we will also be going to Jasper. I can’t wait. More rigs coming into our area…. Chris a new fulltimer from Santa Fe, NM just arrived today and joined up with our group. We had another great “Happy Hour” today and sat around the fire. It is always nice to meet new people. We will also be having more folks come later once the RV Show starts. Another great group tonight and Roger again had a great campfire. Gil and Nancy were showing the pics of their trip several years ago to the “Burning Man” festival. Mike got out his guitar and provided some great music for our entertainment. I spent a lot of money today but cherished every minute and the RV Show hasn’t even started yet. By the way the weather here is super. In the 70’s finally. 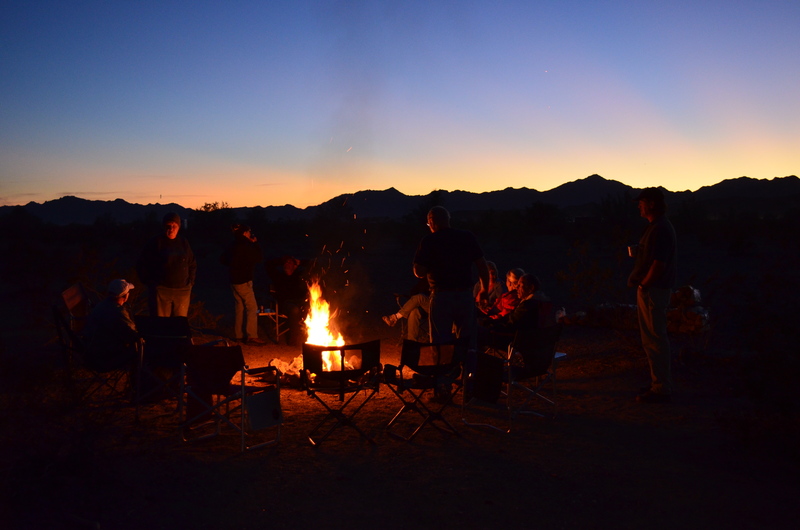 This entry was posted in Alberta, Arizona, BLM Land, Boondocking, Friends, La Posa BLM, Quartzsite, RV Show and tagged Boondocking, Friends, Quartzsite, Toad by Jim Melvin. Bookmark the permalink. I just knew that a toad was in the picture! It looks mighty fine. Good thing you did the part time jobs. One never knows when a great deal might roll along! Enjoy, as I know you will! GREAT looking Toad. 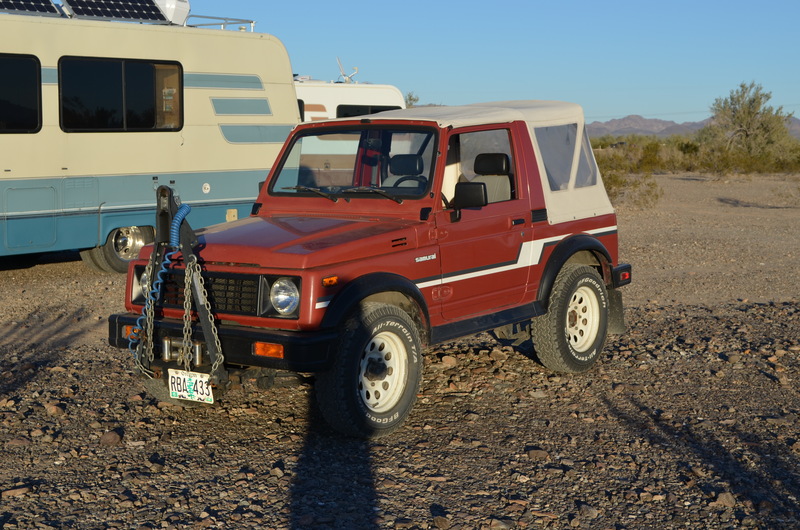 I was headed over to the Quartzsite Improvement Association building today for a GeoCaching meeting and drove around looking for you but no luck. Congrats on the new toad! Looking forward to seeing you in Baker City OR in May! Are you guys going on the trip also. I sure hope so as it will be a great time. You and your friends might think about heading west into BC after visiting Alberta, We have some lovely places to see in BC as well. Jimbo, suggest you visit Kananaskis County which is south of Banff. It has everything except the gazillion tourists and tragic! Locals from Calgary sent us there and it was one of those times of a lifetime. Congratulations on your toad. 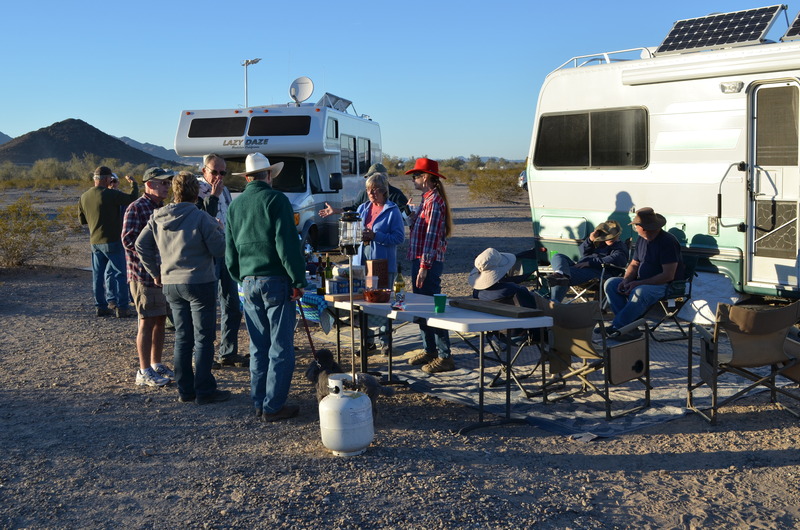 A group if us came over from Tucson yesterday and are at BBLM land behind big tent. Will be going to Boomers and Boondockers this morning. Hope to be able to see your new toad. 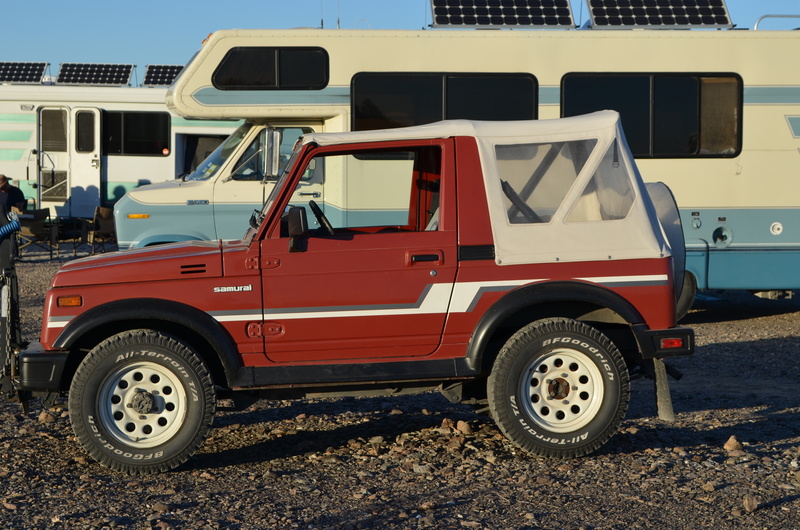 Congratulations on the new-to-you vehicle. We know you worked hard to save up the money. And now you have the freedom to go where you want, when you want. Enjoy!! I hope you are having fun now and not working hard for a change. We are finally getting some great weather. So glad to get out of Fernley. Great looking toad, Jim. Should work lots better for you than a mule, I guess. You won’t have to worry about where to store the hay now, afterall. Hey, glad to hear you are going to make it on that trip to Canada. We just heard about that from Ed and Carol and Gopher. I sent an e-mail to Ed Reed, who is the leader of the Lazy Daze NW group. We’re supposed to be getting newsletters about the GTG’s but haven’t this year anyway. He’ll send me some information. Don’t know yet what we’ll be able to do, but that sure sounds like a fun trip. You are living my DREAM!!! Some day I would love to get your advise on how to get started.